Iron Speed Designer can run your application using either ASP.NET Development Server or the Microsoft Internet Information Server (IIS). ASP.NET Development Server is used as a a generic term in Iron Speed Desiner, referring to the original ASP.NET Development Server, called Cassini, or to its replacement IIS Express in Framework 4.5. On machines using the .NET Framework 4.5, the user is prompted to install IIS Express if it is not already installed on the machine. 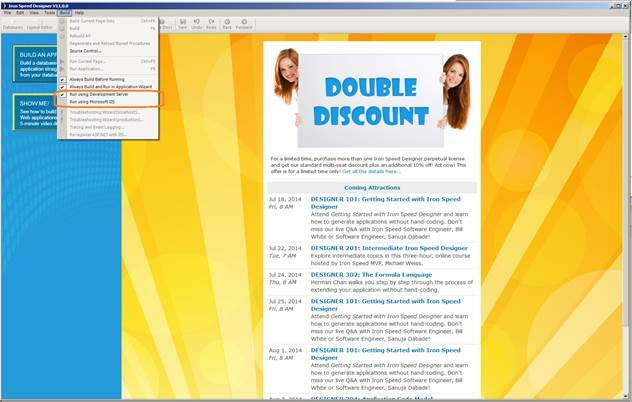 In Iron Speed Designer you can test your ASP.NET pages by using the ASP.NET Development Server or Microsoft IIS. 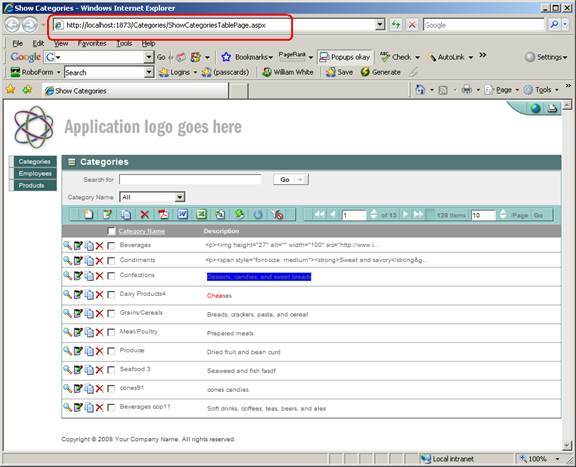 The ASP.NET Development Server is the default Web server in Iron Speed Designer as long as it is available on your computer. It is a Web server that runs locally on most of the Windows operating systems, including Windows XP Home Edition. It is specifically built to serve, or run, ASP.NET Web pages under the local host scenario (browsing from the same computer as the Web server). In other words, the ASP.NET Development Server will serve pages to browser requests on the local computer. It will not serve pages to another computer. Additionally, it will not serve files that are outside of the application scope. The ASP.NET Development Server provides an efficient way to test pages locally before you publish the pages to a production server running IIS. You can change the Web server selection before running an application in Iron Speed Designer using the Build menu. Once you select a Web server, that server will be your default. However, you cannot select a Web server if it is not installed on your machine. The ASP.NET Development Server automatically selects a free port to run your application. You can force the server to use a specific port as explained later. You can select the default web server used by Iron Speed Designer in the Build Menu. Once you have changed the selection in the menu, that choice becomes your default and is saved in your Designer.config file. This will be used each time you start Iron Speed Designer, until it is changed again. However, if your default web server is no longer installed on your machine, Iron Speed Designer will automatically change to the other server. If there is no web server on your machine, you will still be able to build your application, but it will not run. What happens when I run my application using the ASP.NET Development Server? After your application is built, ASP.NET Development Server is started with the folder containing your application as the input. The server will select a free port on your machine and create a browser window containing your application at that port. At this point, you can interact with your application in the browser. The running server will appear as an icon in your system tray. Your browser will show the start page of your running application. If you close your application in the browser, or close the browser, the server remains running in your system tray. If you close the development server, the browser will remain open. This means that any web page in the browser will get an error when it tries to refer to a server which no longer exists. The server is closed by Iron Speed Designer when the application is closed. If you open multiple applications in Iron Speed Designer, multiple versions of ASP.NET Development Servers will be started, each on their own port. If you do specify a specific port, Iron Speed Designer cannot guarantee that the port you specify will be available when you run your file-system Web site.